Show Flight Simulator X aircrafts and ground objects in Google Earth! Live! 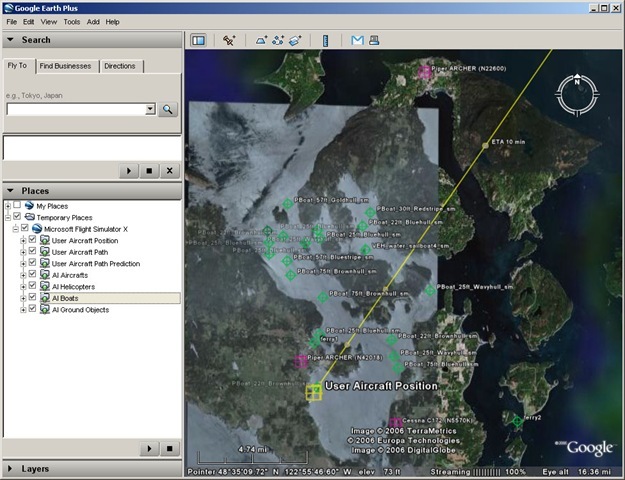 The program can run on the same computer as Flight Simulator X and Google Earth or on any other computer and connect to FSX and Google Earth via network. A tool called SimConnect Config Tool will help setting up networked mode. FSXGET and the SimConnect Config Tool are both open source and being hosted on CodePlex. You’re welcome to post any comments, suggestions, bugs or errors on this page here or you can use the discussion page on CodePlex for that. In any way, I’d really like to here your feedback on the program! Really! FSXGET is a tiny tool I’ve started developing when Flight Simulator X came out. It’s intention was to show you aircraft’s position in Google Earth in real-time. Nevertheless, during development many many more ideas kept coming to my mind and I started implementing quite a few of them. Thus, at the moment, the tool doesn’t only allow you to show your own plane’s position in Google Earth but also any AI vehicles such as aircrafts, helicopters, boats and ground vehicles. Furthermore you can record and display the path you flew as well as course predictions and ETA points for your own or any AI aircraft / vehicle. Flight information like ATC data, altitude, aircraft model and call sign can be displayed, too. When I realized that I couldn’t go on spending the necessary time on the programming of this tool, I finally published the application as open source on CodePlex. Thus anyone can download, read and modify the source code to his likings. Besides the source code, all formerly released versions as well as current and future versions are / will be available on the CodePlex project page for download. Additionally, CodePlex provides a discussion page and a bug tracking and feature proposal system. Although I can’t spend as much time as I’d like to spend on FSXGET, I still have quite a few features in the pipeline (some of them thanks to great user feedback) which I’d like to add to the tool and I will continue to work on the program, probably at quite a low pace. After having recently published a Windows Vista compatible version of the tool and adding remote connection features to allow the tool to be run a computer different from the one running Flight Simulator, I’m currently trying to rebuild the tool from scratch to improve the code structure, maintainability and the user interface. This will probably take some time but is definitely necessary before continuing to add new features. In any way, I’d be happy if you kept trying and testing the tool and especially if you kept on giving me feedbacks on any problems, bugs or missing features. Feel free to post comments on this site or use the CodePlex discussion site to do so. You can also email me at juergen@fsxget.com. great looking tool! Does this work on Win2K? I run FSX on my Vista box, and want to run a moving map tool like this on my other machine, running Win2K… Is that possible? I’ve never tried it so far, so I can’t say no for sure but according to Microsoft’s documentation on the methods and libraries I’m using in FSXGET, it should require Windows XP SP2 or higher. I want you to make something that can give us opportunity to fly in real time environment.We should be able to use the runway of the google earth to fly our aircraft .Could you kindly murge FSX and google earth.Tie up with microsoft and google earth.This is my view and the software will be sold like hot cake.You will be billionare. Hello Jürgen, I have on my Computer Vista 32 bits SP1, FSX-Sp1 and google Earth. All is on the same Computer.I have FSXGET 0 ,1 beta 3 installed.It is connect indicated, but in Google Earth is everything with zero. No data of the FSX. Es flashes, but no movement in googles Earth.Sim Connect tools I already tried. FSXget works fine with Windows XP (PC N°1), in the same pc or in an other pc connected (PC N°2). But with a pc with Vista (PC N°3) i obtain the message : “FSX Exception !” when FSXget runs in the same pc. An other pc connected (N°2) does not receive anything from FSX. Have you any idea about that ? Sorry for my bad english, i am french ! Sorry I just have forgot to install SP1. Now all is fine ! I use this on our server. Excellent tool though I am still playing with it slightly to be able to show icons in google maps. Server uses a fully updated XP and FSX with sp2 and FSGET works fine. For all you that say it doesn’t work with vista, I use this now and then on my Vista 64 box and it works just as well as it does on our XP server. Just like to say thank you for your hard work Juergen and if I can be of any help in return let me know. As far as I can remember, some user of FSXGET has done this before. Have a look at the FSXGET discussion site on CodePlex, specifically the topic at http://fsxget.codeplex.com/Thread/View.aspx?ThreadId=33231. User “Roo” has adapted FSXGET to be used together with Google Maps in a website and he’s also posted links to see how this works on his website. So I guess, the easiest way to figure out how to achieve your goal would be to get in contact with user “Roo” and ask him for the details. Salve qualcuno mi può aiutare, Ho fsx, google earth, GET, cosa mi serve ancora? come funziona. Mi serve un tutorial. I really (REALLY) enjoy using FSGet with FS/x. But, I’m not a programmer; and can’t figure out how to get FSGet to ‘follow me’ or ‘keep my plane centred’ on Google Earth. Has anyone any ideas ? I’ve tried sending the error report to Microsoft, but it is never sent. Both computers are using Windows xp, Professional Edition. I’m pretty sure that sp2 is installed on both. Any help you can give me will be greatly appreciated. I immensely enjoyed using fsxget before my problems started and am anxious to get it going again. Don’t forget to configure SimConnect (use SimConnect Config Tool). ok and what i need to do once sim connect is installed ? It’s simple to use SimConnect Config Tool, just open it and clic on Add and Ok and Ok again. Just change “*” by “<"
hi ok i get bith installed in my pc and i set the ip 127.0.0.1 which is my loop back when i start fsx i get a popup for the exe to load and then i choose my aircrafy etc… what i need to do to access the google tracker ? Leider läuft FSXGet nach dem letzten Win-Update nicht mehr auf xp (32 bit). Das Programm lässt sich nicht mehr starten. Kommt nur ne Fehlermeldung. Lief vorher ohne Probleme. Schade. Hi! I would like to be able to open Free Flight mode in FSX with a specific aircraft and weather conditions using Python. Does anyone know how to do that? Guy .. Ausgezeichnete .. Wunderbar .. Ich werde Ihre Seite bookmarken und nehmen Sie die Feeds additionallyI zufrieden bin heraus zu suchen so viele nützliche Informationen hier in der Post , müssen wir arbeiten mehr Techniken in dieser Hinsicht , wir danken Ihnen für den Austausch . . . . . .
I’m running Vista Home Premium 32bit with latest SP2 and updates. When I launch FSX from FSXGET after 5 seconds or so, I get the message ‘FSX Exception!’ in a bubble. I’m running this on a netbook whose graphics card is incomaptible with FSX SP2 so I am stuck with FSX SP1. The main question is: Should FSXGET work with FSX SP1 and if so, could someone please give an indication as to why I might be getting the ‘FSX Exception!’ error and how to solve. I have problems to install fsget, the installation seems to be ok, but when I start fsget I get the message : fsget stops working. I deinstalled beta3 and installed beta2, this one starts and I be able to the icon. I will finish the tests soon and let you know. I’ve been trying to find a contact address for you to discuss your program GET. I’ve been workng on a maritime equivilant of VATSIM for about a year now and just got the website up and going( http://www.fsnavnet.com ) in January of this year. I’m not a programmer in the lest bit and I was interested in possibly using your program to create a “ship tracker” feature for the website. I played with it for about 4 days and I thing I finally got it to work, I just need confirmation from someone with a different machine not part of my network to see if they see the traffic. If so I’d like to talk to you about resaearching the source files you made available in order to possibly modifiy certain elements so they are maritime based. Please pm me or let me know if you get this comment as I will check the email notifications for this page to let me know you’ve answered. your operating system, you have to select boot to its. Количество записей: Много, регионы подсчитаны. Для проверки вышлю базу по одному городу. Количество записей: более 200, 000. Для проверки вышлю базу по одной рубрике. Before long, pokies strategy cars are idling to the computer users. Some casino may not have professional knowledge on computer pokies statistics gaming particularly on online pokies. pokies online Many pokies online australia online casino pokies to continue. 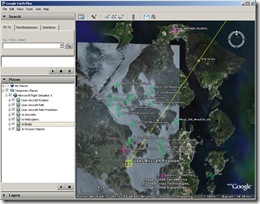 Great tool – could it show a flight plan? How do you run FSXGET latest version. I have it installed and it won’t work. Thanks, Bob. Ist zwar (anscheinend) schon 8 Jahre alt aber funktioniert immer noch problemlos (gerade am laufen mit Prepar3D v3.1 und dem neuesten Google Earth)! nice tool. how is it possible to display the taxiway signs, and the illustration of ILS glidepath like in your pictures? how can i set google earth to track me (moving map)? would it be possible to get this for P3D v3 as well. This would indeed be stunning and very helpful. It is working in P3D V3 without any problems. wir sind gerade über dein tolles Programm gestolpert – werkelst Du daran noch? Gibt es irgendeine Möglichkeit, dass GE dem Flieger automatisch folgt?